Carol Ostrow joined founder Jim Simpson at the helm of The Flea in 2001 and The Guys marked her return to Off-Off-Broadway. 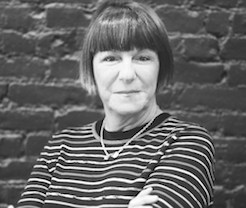 She was the OBIE-award winning Producing Director of the Classic Stage Company as well as the founder and original Producing Director of The Powerhouse Theater at Vassar, now in its 33rd season. In between, she has been an adjunct professor of theater at Vassar College, Chatham College and McGill University. For The Flea, Carol has produced dozens of world premieres and has been responsible for the sound management of the theater’s increasing programming and budget for fifteen years. She is also overseeing The Flea’s capital campaign that resulted in a new performing arts center for The Flea, launched in the fall of 2017. Carol is a graduate of Vassar College and the Yale Drama School. She is a new trustee of Vassar and she also serves on the Board of Advisors of the Yale Drama School. Beyond her alma maters, she is a member of the board of Central Synagogue, the National Psoriasis Foundation, the MacDowell Colony and LAVA, an acrobatic dance collective in Brooklyn. She is also a Wall Street Journal Expert, where she writes on small business for the paper’s online edition. Married and the mother of four incredible and launched young adults, she and her family count Pittsburgh, London, Montreal and now New York City once again as home.